Heat oil in a stockpot over medium heat. Add shrimp shells and sauté 3 to 4 minutes, stirring until the shells look dry. Add celery, carrots, onions, and garlic, continue to sauté for 2 to 3 minutes. Add water, wine, tomato paste, parsley, thyme, peppercorns, and bay leaf. Bring stock to a boil, then reduce the heat and simmer for 1 hour. Strain the stock through a fine mesh strainer. Return to the heat and boil until reduced to 1/2 quart. Will keep 2 to 3 days refrigerated. Stock can be frozen up to 6 months. In a large saucepan bring water to a boil. Add salt and pepper, stir in grits gradually. Simmer 20 to 25 minutes or until all the water has been absorbed, stirring frequently. Remove from heat and stir in the butter then the heavy cream, cover and set aside. Rinse the shrimp and pat dry. Dredge shrimp in flour, shaking off excess. In a large skillet fry the diced slab bacon until brown. Add the Vidalia onions and sauté 2 minutes. Add garlic and paprika; stir and add the shrimp then cook 3 minutes or until shrimp turn pink. Add the shrimp stock and chives; stir and reduce the heat and simmer 10 minutes. Add scallions and cayenne pepper; stir and season to taste with salt and pepper. 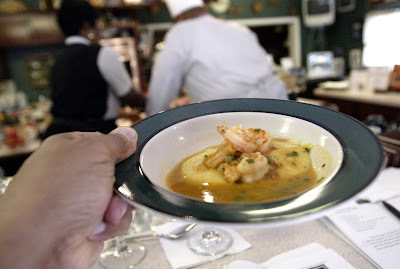 Spoon the grits into center of a warm soup plate then spoon the smothered shrimp over the grits. Serve immediately.